Back when I was a fitness instructor and teaching Oriental/Middle-Eastern folk dance, I invested in a week-long dance workshop in Manhattan. We danced all day, each way, working our ever-lovin’ tails off. I slogged back to my hostel--Leo House, a lovely little facility run by nuns-- exhausted and overwhelmed by my first trip to this biggest of cities. 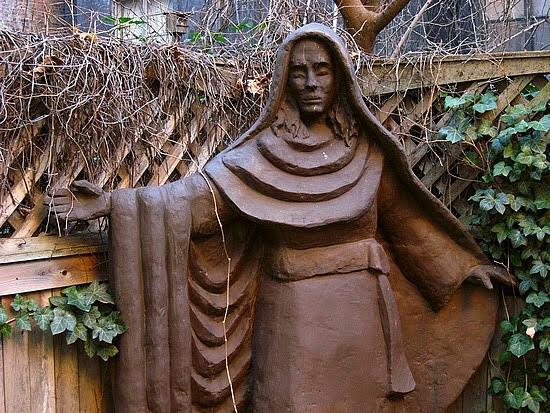 One evening, in this state, I found myself in the hostel courtyard, next to one of the scariest Virgin Mary statues I'd ever seen. (I mean, seriously—look at her!) Not one to let fear or common sense stop me, I began to talk to Mary. I had journal and pen on hand, and rambling aloud moved to rambling on the page. I took down my hallucinatory imaginings of what she'd say. Within minutes I'd fleshed out a scene in which Scary Mary gossips, complains and tells my heroine how to fight dirty. From this scene only a sentence fragment made it into Stone Kissed—but without it, there might have never been a novel. When people ask writers, “Where do you get your ideas?” We cringe. The answer is, we just don’t know. Author Jenny Crusie has a well-developed and joyful theory about the “girls in the basement” of your mind that will tell you everything if you’ll just open the door and go listen. But otherwise, most of us will tell you, “They come as they come.” And we pray that they just keep coming.